Happy St. Patrick's Day my Blogging friends! Guess what!? My sister had her baby! Ireland Gayle. In Boston. How appropriate is THIS!? I'm just excited because her quilt from Aunt Katrina arrived only shortly before she did. My sister and I seem to have some sort of genetic sympathy where our kids tend to be about a month apart. This time, they will be EXACTLY a month apart. Sam and Liesel are 22 days apart. Soon, we will both have newborns to cuddle, as well as a 2yr old's birthday party to plan. While babies are truly fun, I really had to scramble to get this quilt ready, and the more kids I have, the more I realize that I just need to give up this hobby! But I'm glad that she could get one, just like all of her cousins. 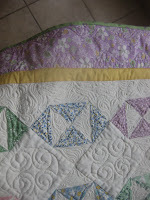 The swirly swirly quilting is called "McTavishing" and I love the effect, and the Irish-y name of it. 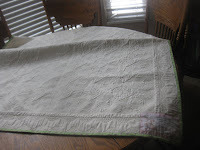 Debbie Lee is my quilter, and she has.... oh 8 kids to care for including one that is going on a mission soon. She. Is. Amazing. And I love her work! The fabrics are reproductions from the 30's, and the design is just a modified 1/2 square, set on point, to look like an hour glass. As my own kids are growing up, it seems like time is all warped - where the days are like weeks and the weeks are like days. There is so much to get through in a day, and yet, all those days pile up and suddenly you are hurdling year after year! So, this quilt is just a little reminder that time goes by so fast with little ones, who turn into big ones. I edged it in green and hoped that it would add a bit o' the emerald to pay tribute to the wee bonny lass, Ireland. Welcome welcome! Beautiful work on the quilt. You are quite amazing. Perhaps when life isn't so complicated you should sell your quilts. Love the label and think the song is perfect! Love you. Congrats to your sister! My nephew was born on St. Patrick's Day. We kept trying to convince them they should name him Patrick, but they went with Andrew instead. Probably good since Patrick Park sounds a bit strange. A beautiful quilt; you are very talented. 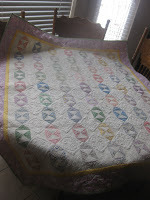 My friend who lives up in Highland a few miles from you is a big quilter too (she goes to conventions and everything). I should hook you two up. I love this quilt! I think it may be one of my very faves that you have done. (Which is odd, because I'm not a "pastel" kind of person) Flaming June is my all time fave......it's the whole orange thing. You are so talented, thank you for sharing it with the rest of us! I can attest to the fact this quilt is even more gorgeous in person. Today I was absolutely determined to get a good picture of Ireland lying on it but we ALL had a rough night. We think Liesel had a nightmare and Ireland could NOT be lulled to sleep until 2AM. Usually either Brent or I are up to it but we were both out of gas. It's coming... I promise!!! Beautiful K. How are you doing? I'm thinking of you during these last days of pregnancy. Your humor keeps me smiling. We want to visit Utah during the week of June 28-July 2. Will you be around? Can we stop by and visit your fam? You are a better aunt than I! Beautiful!